Lord Arkus of Blackriver Castle readily admits that he is a villain and sees no reason why it should stop him from being the protagonist of this book. After all, Prince Kellemar, an aspiring hero, has defeated him in a rather questionable way. Bound to Lord Arkus for five years of service and sworn to act in his best interests, the Sparkling is not easy to get rid of, and of course his understanding of “best interests” is quite different from what Lord Arkus has in mind. This is...going to be a bit of a weird, catch-all review, because the fact is, I have never listened to an entire audiobook. I've tried, I really have, but generally the reader gets about 3 sentences out before I say, Um, no. The farthest I've ever gotten in an audio was about 1/4 of the way through The Forest of Hands and Teeth - and though I really actually did like the narration, the only reason I even picked it up was to refresh my memory on the story and style. So agreeing to review an audio was a gamble, as I let Laura know. And I'm going to try to address both the story and the audio aspect, but in the end, I feel like I can't quite separate the two, and couldn't tell you whether I liked the story because of the narration, or liked the narration because of the story. Because I did like it. There was a huge adjustment period, though. Probably the first 40 minutes was spent with me not being able to focus and finding that my mind had drifted and 10 minutes of audio had passed with out me really absorbing a thing. And I can't really blame that on the story or the narration, because I don't think either was to blame. It's just...I don't like being read too. I was the weird kid that didn't say "Read me a story" but said "I can do it myself!" My mom has this habit of bringing magazines or articles to my attention and saying, "Did you see this?" and proceeding to read them to me. I'm sure most people would find them endearing, but my mom should know better. She knows I hate being read to. I really, really do and I couldn't not tell you why. It just makes my brain feel...cluttered. And I'm sure part of it is some insane control thing, too. So yeah, like I said, this was a gamble. I process differently when I'm listening instead of looking, and it took my brain a bit to switch over and accept that this was how the story was being told. And if this wasn't for review, I probably would have given up. But I didn't. I had chores that needed doing, and where I normally listen to music while cleaning (because that is the only thing that gives me incentive to clean or *gulp* do laundry), I instead put in my headphones and settled into to listen to MSM. I was all prepared to slog through, and you know what? I instead found myself really liking it. I guess having mindless busy work to do gave me enough to focus on that my brain couldn't wander, and I actually started to absorb the story! I did more chores so I had an excuse to keep listening. Guys, this audiobook thing is genius. So once my brain switched over and I could actually listen to the story, I found I really liked it. It's not necessarily anything I'm going to rave about or push on all of my friends, but my friends with sons will probably hear about it. It's funny and fairly wholesome, and I was surprised to find myself actually smiling on multiple occasions. Smiling is not something that normally happens while I do dishes... Weirdly, I think that the audiobook helped in this aspect. With an audiobook you can't look ahead, even accidentally, so things do take you by surprise and catch you off-guard, and this humor that crept upon me actually made me chuckle as a result. And the voice acting was pretty magnificent. A.T. Chandler, who does the narration, reminded me a bit of Danny Elfman as the singing voice of Jack Skellington. (And I know, you're like, Why doesn't he remind you of Chris Sarandon, who did Jack's speaking parts? Is there singing in this book? But there's just a way that Elfman uses his voice, and though Sarandon does it too, I'm sure, it's most memorable and noticeable to me in Jack's songs.) Chandler did lots of different voices, and they all seemed seamless; I never had trouble knowing who was talking, because the voices were all distinctive and memorable. And he was good at accents and ages/sexes. The way he used his voice and the accents he used were part of what made me smile. I couldn't help picturing Jack, as I said, or Groundskeeper Willy, and a few other people. It was...neat. Where I generally have issues with the voices of narrators, I couldn't fault Chandler at all. And in the end, I did end up liking Lord Arkus and his journey. He's a fun, unwillingly round character, who grows a lot and hates every minute of it (he says), and it was pleasant. I most especially loved the symmetry between Arkus trying to be a villain and ending up a hero, while his nemesis is trying to be a hero and ending up a villain. It was a charming, fun story that I think will appeal to young boys looking for an adventure story, and mothers who don't want their kid's adventure stories to be gruesome or age-inappropriate. 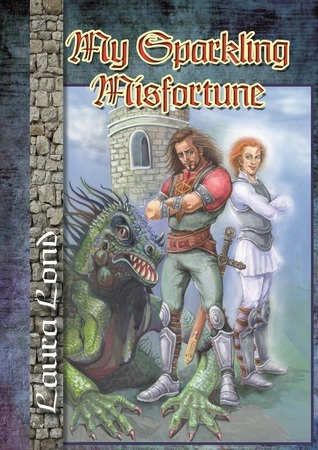 Don't forget to check out my interview with Laura and my excerpt from My Sparkling Misfortune! I usually hate being read to as well, but I've truly come to love audios. You're right about them being brilliant to do chores to. I looove listening to them while I fold laundry (a chore I usually hate).